It is Saturday evening and I am thinking about Thanksgiving. How wonderful it was to be with my family at my parents’ home. Even though I ruined the rolls. (Yup, I did.) It was my second attempt and they didn’t rise. I showed up with sad little circles of bread, the size of a silver dollar. Flat as matzah.No need to go into the mechanics of bread-making and why yeast and I miscommunicate. Or how hard I laughed when Doug made himself a teensy turkey sandwich with one of the rolls while the girls fed theirs to the birds by launching them onto the roof. And they really didn’t. No one cared about my silly rolls. It wasn’t what mattered. What mattered were the amazing people that sat around our table. My sisters and their husbands. Their children. My Dad at the head of the table, my Mom to his right. You see, we’ve learned from my Mom not to waste ourselves or our happiness on things that just don’t matter. Please pardon my retelling her story. I’ve shared it before. But she is writing a new chapter and I want to tell you about it. Almost twenty years ago, while I was studying abroad in the Middle East, my Mom was diagnosed with a malignant brain tumor. She was 48. A mother of six. We were so worried it would take her life. We prayed fiercely for a miracle, believed if Christ could heal in ancient days, he could do the same now. And after two surgeries and radiation, doctors felt they had removed the entire tumor. We were beyond grateful. We became first-hand witnesses to God’s love and miracles. That experience confirmed what we had hoped was true. God was real and he answered prayers. Five years ago, the tumor returned. But closer to her motor control center. Additional surgery removed as much of the tumor as possible. After which, she did a year of chemotherapy. I had just had the boys and, somehow, she felt well enough to stay at our home several nights a week, to help me bottle feed our tiny 5 pound babies, one of which was still on oxygen. This too was a miracle. For three years, her tumor, which is impossible now to remove, has done nothing but occupy space. She has felt strong, healthy, and happy. And every day, my prayers have expressed thanks to God. That he allowed her to stay.Three months ago, while she and my Dad were driving across the country, she began to have sensory seizures. This concerned her, and my Dad. They spoke with her neurologist who encouraged them to finish the trip but schedule an MRI as soon as they were home.Sure enough, imaging showed that the tumor was growing again. A month ago we met at my Mom’s house to celebrate family birthdays. The leaves from their large maple had fallen so the dads raked them into a big pile for the kids to play in. And Mom? Well, she didn’t want to miss out on the fun. So she jumped right in and sat down in the middle of the pile. She was feeling well this particular weekend. But previous weeks had been rough. After her last MRI, she started chemotherapy at an increased dosage. She was due to start her third round this coming Monday, but a drop in blood platelets will defer her chemo for a few more weeks. Which is a relief of sorts. Because she will be able to enjoy the holidays. Her first week of chemo I stopped by several times to see her but she was always asleep. She was exhausted, she had no appetite, and the medication made her feel awful. It is hard to see your vibrant Mother not feeling well. Hard to keep the children away because her white blood cell count is low. Hard to watch her, knowing she is miserable, and there is nothing you can do about it. Which is why I am so glad I had my camera this day. A day when I caught her doing what she does best. Being present. Enjoying the moment. And loving the people around her. 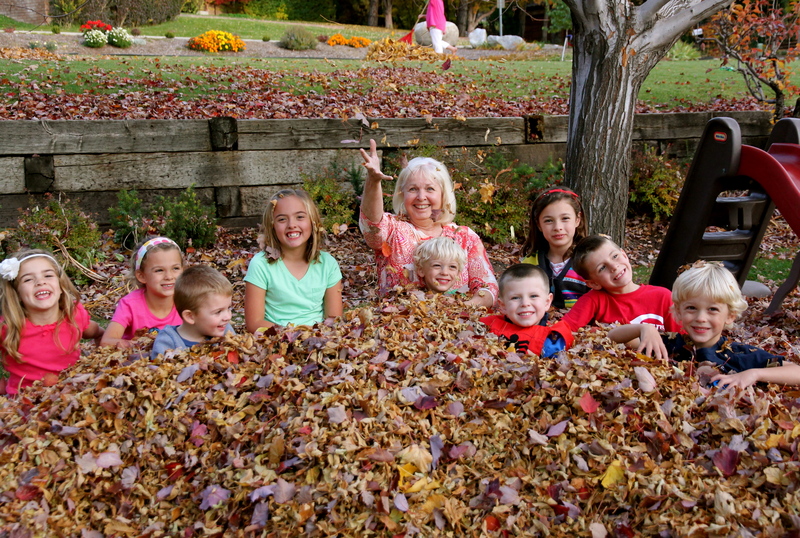 The kids were squealing and diving, while they tossed, kicked and sputtered leaves. Gordon left the tree and climbed right into Grandma’s lap. Sometimes the flurry of leaves was so thick, you could barely see her. After dinner we made caramel apples. Every time I’m in her kitchen I notice the words above her sink. You can see them here. Words of the Savior to Jairus in Luke 8:50, before he raised Jairus’ daughter from the dead. This is how my Mom lives. Truly. She has no fear. When I phoned her the day she was to meet with her neurologist to discuss findings from the MRI, I said, “Are you worried?” She simply said, “No.” It wasn’t worth pursuing or trying to dig it out of her. She wasn’t worried. And I knew it. It hasn’t always been this way. But I’ve seen an unusual peace and confidence grow in her over the years. She has been living in a state of question for so long, she has learned the only way to survive is to trust. To trust that her life is in the hands of One who will absolutely do what is best for her and her family. That whatever suffering she has to endure will work for her good. That God will take all hard things and make them a blessing to her and those who love her. And there are so many of us who love her. My children love being in her home. They love working in the garden with her, planting beans, snipping roses, picking apples from her tree. They love coloring on her counter, pulling out her old Fisher-Price toys, and snuggling onto the couch with a book. Every moment we are with her, we are grateful. My children pray “that she won’t die; that her tumor will go away.” That’s how they process what’s happening. That’s all they know to say. Because I’m not sure we’ve gotten to where she is, when it comes to fearlessness. But she is leading us there, pointing the way, guiding our thoughts and perspectives into a place of submission and understanding. Twenty years ago I thought I understood faith. I thought because God had answered our prayers, faith was power. Power to move mountains, calm raging seas, destroy cancer. And it is. But I understand now, that faith is more. It is being willing to submit when the mountain stands still, when the seas overturn your boat or your world. It is accepting a cancer that isn’t going to go away. I am also learning from my Mom, that in all our understanding and experience, there can still be joy. Mom, you are the bravest woman I know. Your mother is amazing, and I am so happy you shared her story. Courage and grace just beam from her ageless beautiful self. I adore how she continues to build memories. And these photos are priceless! Thank you for sharing, Catherine! Such beautiful words. Love it. A beautiful tribute. Beautiful. I admire her faith and acceptance. I want to adopt that scripture verse as a theme for my life! I constantly struggle with worry, even though I do have great faith–how is it possible that I have both? I hope I can get to the place where your mother is someday–where the faith is stronger than the worry. Thank you for sharing her story! What a brave and courageous woman your Mom is! Many prayers for all of you. I love that you see all of this wisdom in her graceful courage. Hers will be a story that her posterity can tell–a tale of deliverance that they can recite reverently. Thanks for putting it into writing for the rest of us to read. Those pictures are so priceless, so beautiful…the leaves, your mom, your words, the love she exudes even through the camera! I love your mom too, because I see her in you. In some ways our culinary failures become more fun than our biggest successes. You and Doug will share the turkey sandwich joke for years to come! The story and photos are such a sweet tribute to your wonderful mother. Spending time with your family has always been delightful. How blessed we all are to have Ronda in our lives. Lisa – thank you for commenting. You understand far too well the principle of submission and surrender. Love you. Cristie – graceful surrender. My Mom felt your two words captured it best. Sure love you! Shir – wishing you'd been there with us. Rachel – thank you for your sweet thoughts. I read your story about your mother the first time it ran on POMs. I was so touched by her ability to love so purely. And the way you all cared for her, made life as beautiful as possible. Thank you SO much for sharing. I know her life and story have touched so many. Cheryl – thank you. prayer is so helpful, and real. Liz – yes, we are already telling her story. I'm so grateful for her faith. And for hearts like yours who are willing to hear her story. Em – thank you for reading. I agree. So glad we have the photos. Lots of love and happiness in her face. Michelle – You are so right. We will laugh over that one for a long time! Leslie – always supportive and compassionate. So grateful you are family. we love you. Oh, Cath. Somehow I missed this. My heart is with you and with your family.